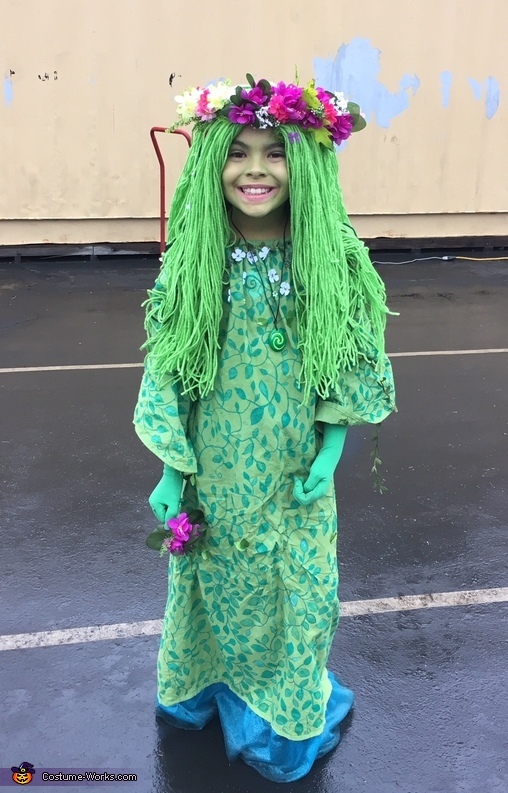 My 8 year old daughter is wearing the TeFiti costume. After last years dragon costume I wanted to go with something easier. Thankfully she liked the idea. I used white muslin for the material and found a pattern from Pinterest for a basic peasant dress. I just adjusted it to make it longer and dyed it green. I found a stencil at the dollar store to make the leaf pattens. We started with the stencil but found it was easier to just do it free hand. We used a fabric marker in two different shades of green. One was a pearlized color. I tried do fill sections with french knots but quickly learned that was taking too long. I stitched leafs and flowers on the dress. I ran out of time because I still had tons more felt flowers that I wanted to stitch on as well as leaves. I didn't go with glue because I didn't want them to fall off during the night. The wig is made out of yarn and it was stitched onto a cap I made using one of her old pair of tights. I put them on her head, tied a knot with the legs so I knew where to cut. I stitched right below the knot before cutting. There were some great tutorials on making this on Pinterest. The crown was made from flowers I bought at the dollar store as well as the floral tape that I used to make the crown. We already had some wire to get the basic shape of the crown. I bought the necklace on etsy because I didn't have the patience to mold it on my own and paint it but I also found some tutorials on Pinterest for that as well. We didn't have to paint her hands because I used a pair of green pantyhose I found at the dollar store. I made gloves out of them for her arms. Most of the items purchases were either from the dollar store or Joann Fabric store. I want to say that overall I spent about $40 between the dollar store and the fabric store with coupons.